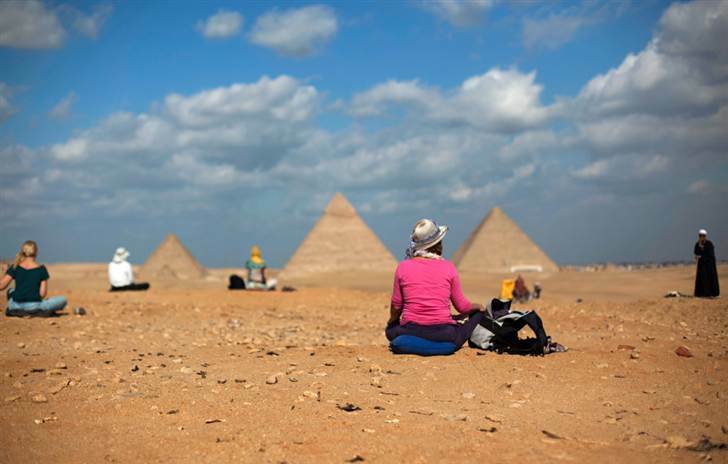 Depending on whose figures you use, approximately twelve million people visit Egypt each year. From all parts of Europe, they are rounded up and packaged into inexpensive tours and arrive in plane loads or ship loads to be repackaged into bus loads and deposited at the tourist sites. Wherever Donald and I went, we had the feeling all twelve million tourists had just arrived ahead of us. It was a struggle to view the monuments without peering over someone’s shoulder or around the back of someone’s head. When walking in front of the crowd to get a better view, we constantly had to apologize for interfering with someone’s photo. When they look at their photos, I am sure many will wonder who we are. Briefly stated, the crowds made it hard to maintain the aurora, if it was a popular monument, we saw it from the back of someone’s head and if it was precious and found in all the art history books, it was closed. At times, it was hard to fight off the debilitating sense of frustration. Even though they are not able to alleviate their traffic nightmare, they have been very cleaver in organizing their tourist sites, adept at moving people quickly in and out. The parking facilities are the size of football fields and bus drivers park their buses so close together that passengers can only pass between the buses by standing sideways. With their motors running and air conditioning blasting, they are leaving yeti size carbon footprints. Each monument has an organized entryway through the main gate with a ticket taker and the exit is always through gift shops that are set up like a souk where individual merchants sell a variety of Pharaonic kitsch. The owner of these mini shops is usually the overweight man sitting in the corner, wearing a white shirt and drinking sugary mint tea from a juice glass. His sales clerk, usually a member of his extended family, is in the aisle hawking his wares. They approached us with beaded necklaces, shawls, Arabic head scarves, pocketbooks, guide books, draped over their arms and around their necks and miniature busts of Nefertiti and small pyramids stuffed into their pockets. Even before we had a chance to say no, they would lower the price. Compared to the aggressive Asian vendors, these people are tame. One firm no thank you and they were off, maybe because behind us were twelve million more opportunities. Even though there are Egyptian specialties and I am sure every Egyptian male loves and honors his mother’s cooking, there does not seem to be, at least in America, a designated Egyptian cuisine. When you consult Zagats for New York, there is no separate listing for Egyptian restaurants. Egyptian food, such as it is, is considered part of Middle Eastern cuisine where the Lebanese reign supreme. Most nights we consulted the tour books, the guides, and the concierge for restaurant recommendations, left the comforts of the hotel, flagged down a cab and were off for an evening’s adventure. We soon realized the variety of food was limited and often we repeated for dinner what we had eaten for lunch. Of course, there are no pigs, no bacon, no BBQ ribs but the chicken was usually good, the beef as kebabs workable and much better when it was minced up like kofta and surprisingly, the lamb, which was probably mutton, unworkable. But like the denizens of Santa Fe who must have a daily chili fix, we always looked forward to the selection of mezzes that always landed on the table in plate after plate. As addicts, we dipped pita and flat bread into plates of hummus, tahina, babaghanosh, labneh, and fuul. We devoured the falafel and the salads of tabouleh, even though we had to spend the rest of the day picking parsley out of our teeth. Like anywhere else, we could judge the quality of the meal by the selection of bread, when it came warm, the food would usually be good. Sadly, so many times the pita was cold but the Middle Eastern pastries never failed to satisfy. As for my opinion, the best Middle Eastern food is still Time Out Deli in Knoxville, Tennessee. We found out very soon that beer, wine, and whisky are available only in hotels or restaurants catering to foreigners. If you do not want to pay five to seven dollars for a can of beer, then you can always chose from their excellent selection of fruit juices. However, for a country that does not approve of drinking, they have an excellent beer, Stella. As they have done in other countries, the Germans taught them how to make it. As for wine, they produce a red wine that is so bad someone would “have to hold a gun to your head to make you drink it.” The white wind is acceptable and went down easy, especially when poured over a glass of ice. However, the best of all was Arak, sweetly smelling of licorice and soft on the pallet. Egypt has three main sources of income: tourism, the Suez Canal, and remittances from overseas workers. We were advised that tourism represents 20% of the GDP. Since Sadat’s l978 peace treaty with Israel, home grown militant Muslims have targeted Egypt, hoping to dislocate the tourist industry. The attacks during the 1990’s, climaxing with the 1997 bombing of a tour bus in front of the Cairo Museum to be followed a few weeks later with an attack on tourists in Luxor at the temple of Hatshepsut, sent tourist numbers plummeting. In 2005, Sharm el-Sheikh, the famed diving center and main tourist city at the end of the Sinai Peninsula, witnessed the destruction of much of its old market area along with the deaths of a sizeable number of tourists. Today, the area is just beginning to recover. As a result, the tourist sites and much of Cairo and Alexandria are under the protection of the tourist police. X-Ray machines screen all bags and tourists can be padded on a regular basis. It will take only one terrorist with a well placed bomb to cripple their tourist industry, which in turn would be devastating to their economy. Nevertheless, as with so many other aspects of Egypt, the need for security is juxtaposed with a laxness of execution. THE PAST THE PRESENT BUT IS THERE A FUTURE? Five thousand years ago, the Egyptians were brilliant, witnessed by the construction of the pyramids, their advances in agriculture, medicine, and science. Yet today, they are so stymied by the presence of modern dilemmas that they cannot alleviate their traffic problems, free themselves from their suffocating pollution, or find adequate housing and jobs for their twenty plus million people. By 2:30, the traffic in Cairo no longer flows and as time passes, it ripens to a standstill, a parking lot with drivers so resigned to this state of affairs they rarely honk their horns. Then if there is a brief opening, cars rush to fill the void, creating another traffic jam that requires more time to sort out because no one gives the other a chance. Both Cairo and Alexandria suffer from a lack of traffic lights and rubbish bins and even in five star hotels, the water runs the color of sand. Since 1992, Donald and I have traveled widely, especially in third world, developing countries and know the intellectual dishonesty inherent in comparing one place to the other, one culture to another. But Egypt is different, it did not develop in a vacuum. Since it was “discovered” by Napoleon in the early 19th, it has developed under the watchful eye of Europe. Until the advent of Nasser, after his 1952 coup, Egypt had leaned toward the West and no manner how mismanaged, it had been under the governing hand of England and the cultural influence of France. In 1956, Nasser denied the western concept of democracy and the respect for the individual and began to reclaim Egypt’s Moslem heritage. The French language was out, Arabic was in. Foreigners and non Muslims were encouraged to leave and others were forced out, even those who had made their home in Egypt for generations. Nasser’s mysterious death from a heart attack in 1970 led to the advent of Sadat, his second in command. From that time, Sadat turned his back on Russia, ended Nasser’s nationalization policy with a return to privatization and made peace with Israel, for which he paid with his life. Since the time of Sadat, Egypt has been in transition with elements of society embracing the modern world, globalization and all that entails. As in every developing country, the elites seem to be doing well, but not everyone is making the great leap forward. In addition to being a tour guide, the good jobs are in the civil service, the police department, and the army and, as per tradition, these coveted positions are obtained mostly through family contacts. If all else fails, Egyptians work outside the country, mostly in the Arab world, where there is a chance of being mistreated or cheated out of their pay. Faced not only with a stagnant job market, the Egyptians are experiencing increases in foodstuff and the cost of living has sky rocketed. For many, the promise of prosperity has been forgotten, replaced with a lack of hope. Today, Egypt is fragile but it is the patience of the people and the power of the government that is holding organized society together. As palpable as the pollution, a malaise of futility has settled over the country. When we spoke to the people, the taxi drivers, the hotel baggage handlers, the waiters, we could feel hopelessness and the lack of optimism for the future. When we went to dinner with my daughter’s friend, Jon Shippard, a Fulbright scholar and a political science professor at the American University in Cairo, he took us to an up- scale restaurant. Here we had the opportunity to observe what could be considered Cairo’s young Jet Set, the scions of wealthy Carines. The parking lot was packed with Mercedes and drivers waiting. Not one woman was wearing a head scarf. Instead, this smart set was concerned with the latest fashion. Women were wearing tight jeans and revealing tops, enjoying the company of men and smoking sheshas. The beer and wine was flowing and the music was Arabic hip hop. While these affluent young people are seeking answers in the global community, others are turning to their religion. In the 1920’s, women desiring to be modern, threw off their abeyyas and headscarves, somewhat akin to American women burning their bras in the 1960’s. But today, the freedoms sought by their grandmothers is being thrown on the dust bins of history as almost all women in Egypt are wearing head scarves and many more are reclaiming the abeyyas, covering their bodies and well as their faces in black. The soul of Egypt seems to be caught in a vise of its own making. The moral authority lies with the time honored traditions, expressed in the strictures and traditions of their religion: mullahs, prayers five times a day, Friday prayers, madrasses where students learn nothing more than how to read the Koran. Whether or not it is part of the religion or Arabic tribal society, women are expected to be subservient. But the sirens of the secular global world are calling and many are answering. Egypt is becoming a schizophrenic society, to learn to recite sutras by heart or to learn how to order from a wine list. As for the future, inshallah. Why can’t they have both?